Every day, digital agencies and in-house SEO and SEM teams use different tools for optimizing and promoting their clients' websites. Project managers and heads of online marketing teams have to choose the right solutions, manage plenty of licenses, and make sure that all software is renewed and paid for on time. To make license management smooth and easy, we’ve created SEMrush Corporate Plans and Accounts! Why should I consider Corporate Plans? SEMrush Corporate Plans provide key benefits that are hard to resist! Get a fully-customized product. Is the Pro Plan too small? Is the Enterprise one too big? Or is the Guru one not enough? Now you can create your own product, and get as many projects and as much data as you need. Every user gets his or her own account. The biggest inconvenience of Guru and Enterprise subscriptions was that both allowed only one login and password for all team members. Also, it was very easy for users to mix up projects. Now every user will get a SEMrush account with their own email address and will be able to manage their projects from their own SEMrush console. This feature also brings data privacy. Secure licenses prevent others from entering your account. Manageable licenses mean that new employees can gain access, and former employees can be blocked or removed, in minutes. It means that only responsible parties at an agency (project managers, team members) can see a particular campaign, its keywords, competitors, reports, etc. Moreover, agencies that are sensitive about privacy can be confident that their clients’ data can be completely obliterated or deleted at any moment. Keep your payments under control. With SEMrush Corporate Accounts, you can pay for all your subscriptions with one credit card and view your payment information from one place. You can also pay via PayPal or wireless transfer. To start using your Corporate Accounts, you should send your request to our sales representatives at mai[email protected]. Depending on your company's and your team's needs, users will be able to create individual packages. Once your product is created, you then can invite others to start using it! Attention: API units are available via Corporate Products upon request. - Click the Add user button (2). - Type into the respective fields (3) the email address, name, phone number, and position of the user you'd like to invite, and click Save. - If a user has already been using SEMrush, you will get a notification reading “This user has a SEMrush account (4).” Click the OK button to send an invitation. - Once an invitation to join a Corporate Account is sent, the prospective user will receive a notification via email. After accepting the invitation and joining the account, the user can then start using SEMrush as a Corporate Account user. Attention: If a user currently has a SEMrush subscription, it will be cancelled after accepting the invitation to join a Corporate Account. A new user’s account will be linked to a Corporate Account and will become dependent upon it. You can view a list of invited and joined users (5) in the Manage Accounts tab, and edit (6) their information. If you delete a user from your corporate account, this user's subscription will be downgraded, and all projects exceeding the limit will be removed within 7 days. 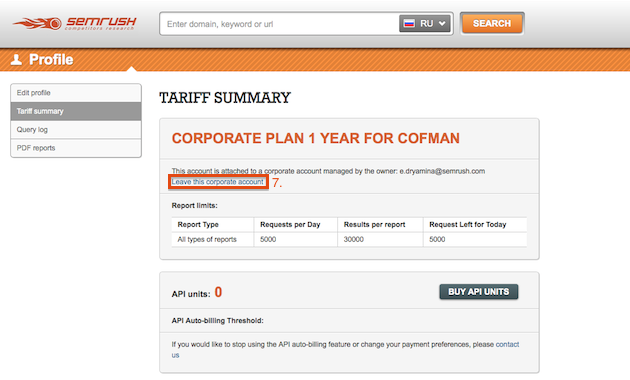 Attention: Corporate Account users can also leave their accounts themselves by clicking on the link labeled “Leave this Corporate Account” (7) in the Tariff Summary page (in this case, they will be downgraded to a free subscription), or by purchasing another SEMrush product. With the Query Log (8), you, as a corporate account manager, can see your account users' requests for SEMrush data. You can filter queries according to a user's name or email address (9), and the precise timeframe in which requested queries were made (10). The account manager can only see the activities of users who are currently using the Corporate Account. The manager can't view any requests made by the user before joining or after leaving the manager’s corporate account. The Activity Log (11) helps you to track who joined or left your Corporate Account and observe the statuses of your invitations. A Corporate Account’s manager is responsible for payments. He or she must pay for all user licenses linked to the account by credit card, wire transfer, or via PayPal. Other users have no access to the Corporate Account’s manager's payment information. If a user previously had their own SEMrush account, the manager can't view any transactions the new user made before joining a Corporate Account. At SEMrush, we hope that our Corporate Accounts will prove a handy option for license management and payments for digital agencies and in-house SEO and SEM teams. The first 100 clients that sign up for a Corporate Plan will get a special discount! To unite your team members under one Corporate Account, please contact us at [email protected]!